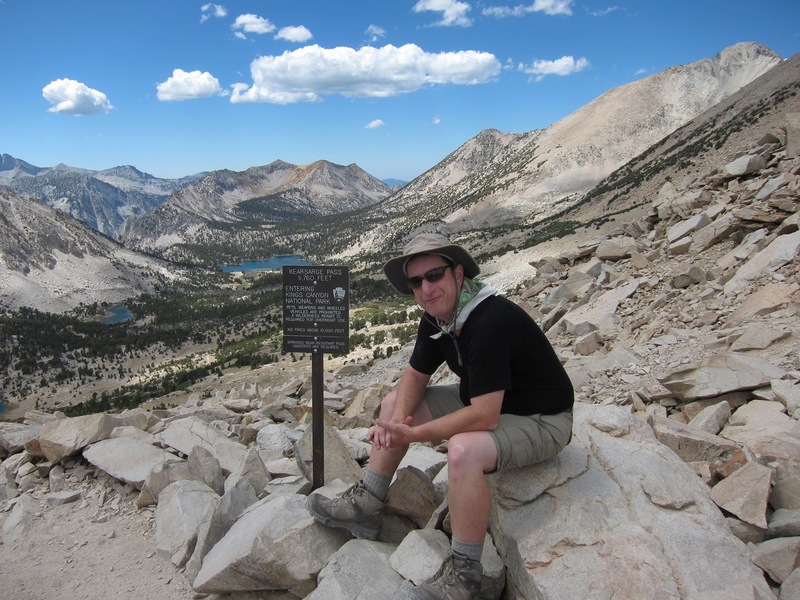 Antony embarked on an inspired adventure to backpack in the Eastern Sierras and Summit Mount Whitney. A trip he dedicated to his father. I watched his periodic updates and followed his Spot tracking web page. On the day of Antony's summit attempt, I watched anxious and excitedly. I hooted when he reached the summit. 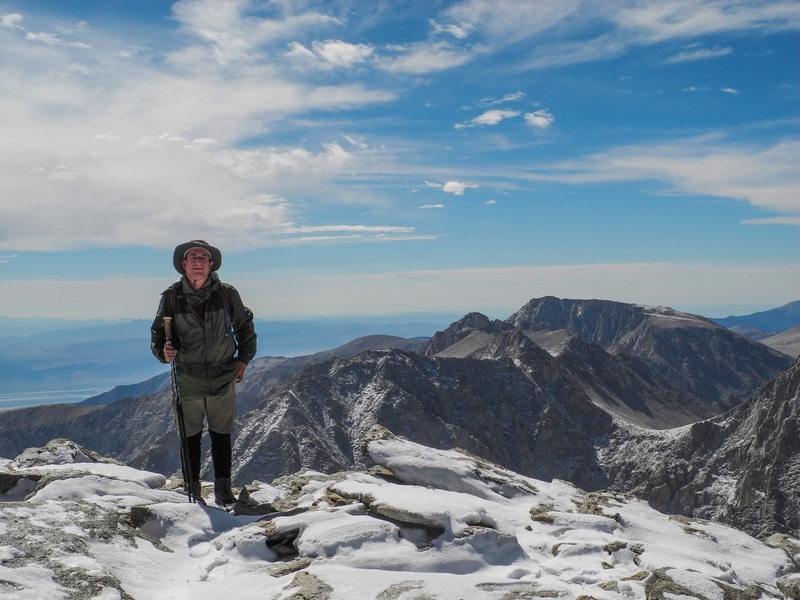 After his return, we were chatting over beers and we talked of my new found desire to have a similar adventure and eventually reach the summit of Mount Whitney myself. A relatively normal family man sits with his friends at a local craft beer hangout. By the end of the evening, the Mount Whitney Sanction was brewing. 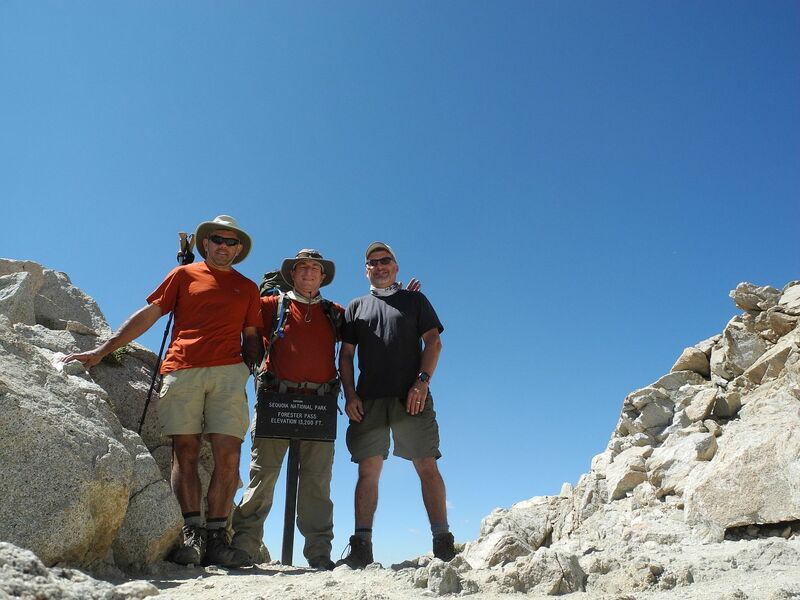 Myself, Antony and Laurent established plans and procures time off work for 10 days of backpacking in the Sierra Mountains. 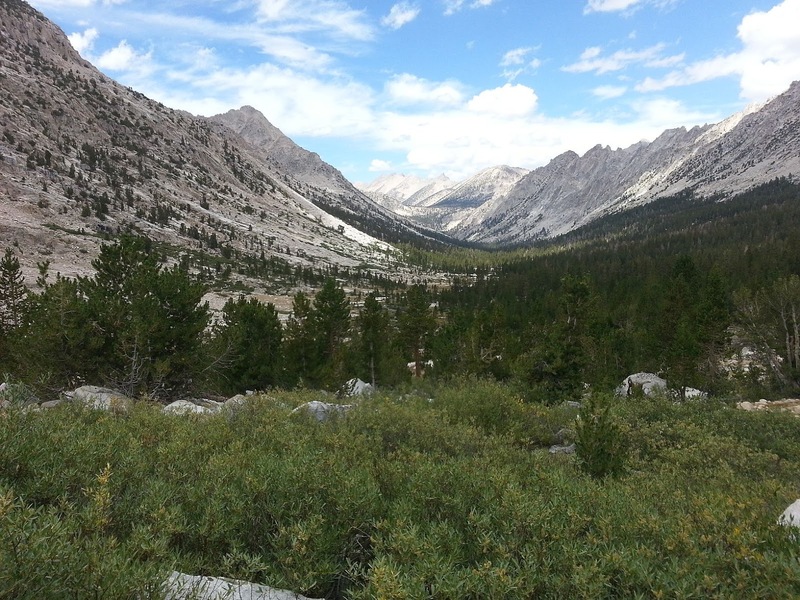 We decided to enter from the Onion Valley and over Kearsarge Pass. 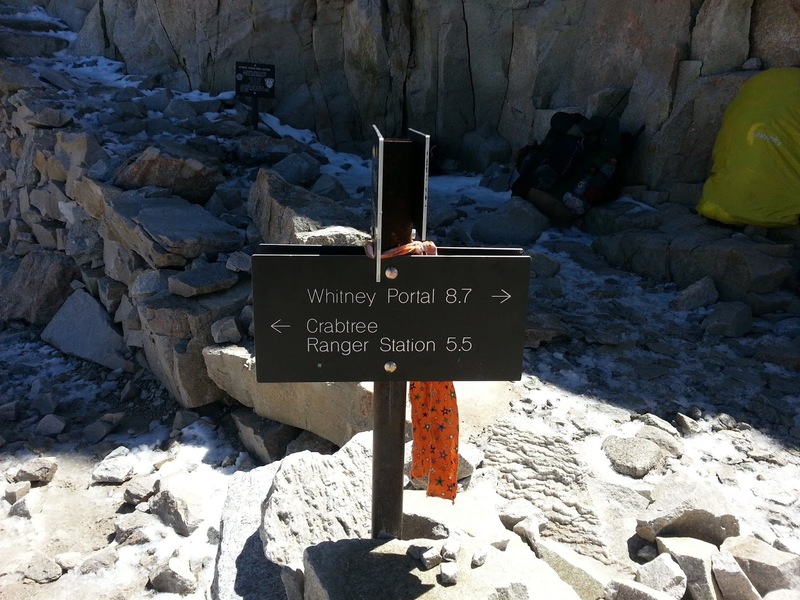 We would exit via Whitney Portal 9 days later. Permits were acquired. 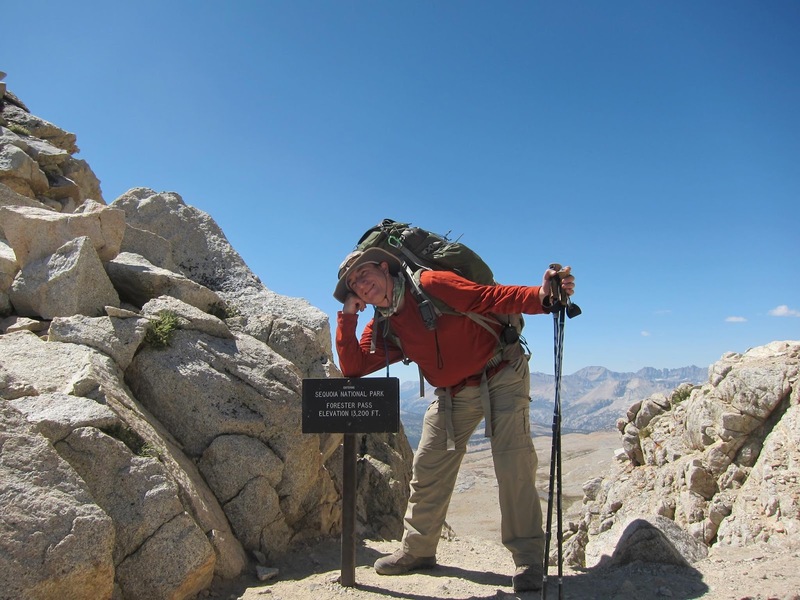 Additionally, permits were acquired to hike Mount Langley two weeks prior to this trip as a warm-up and test on my ability to reach a 14,000+ foot summit. 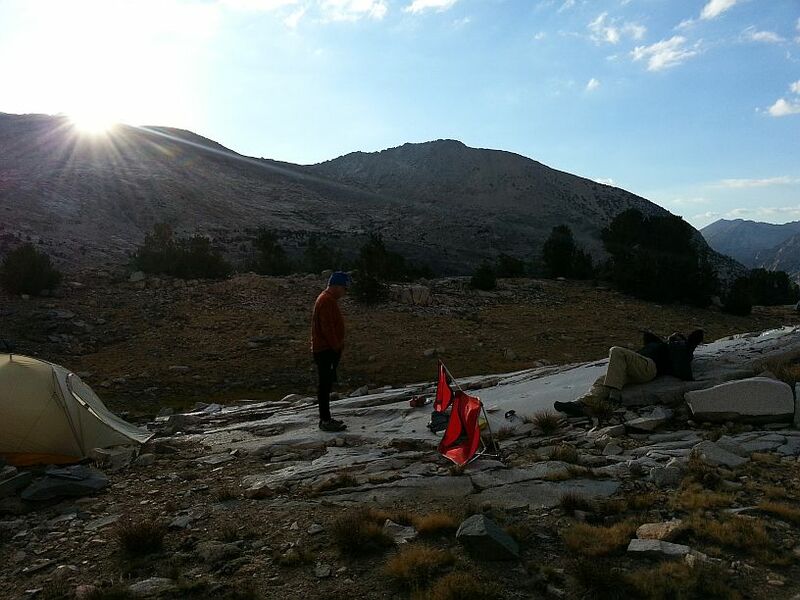 The next seven months were spent planning an re-planning routes, camps and other peaks to climb. 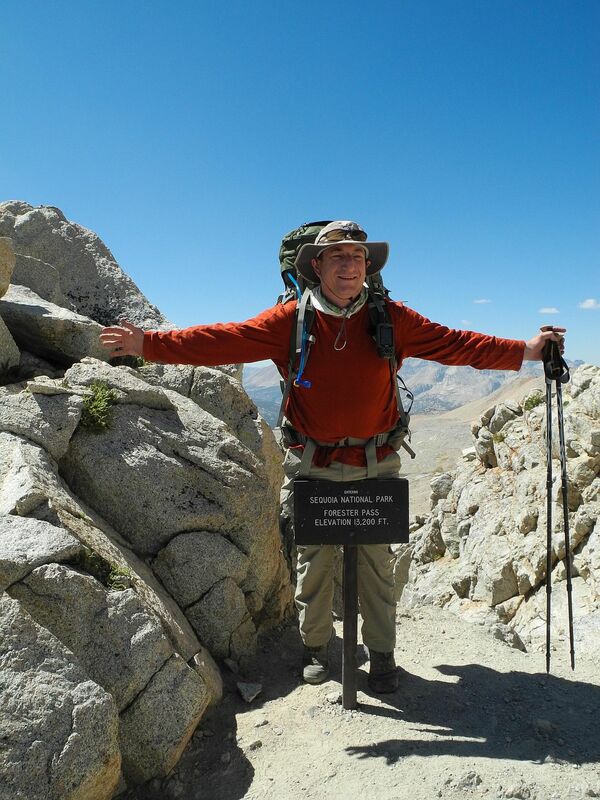 I got a lot of advice from my friend and very experienced backpacker Dewey. Of course Antony and Laurent were a wealth of help and advice. Friends and highly experienced David and Rebecca were a great source as well. Of the equipment I did not acquire, I needed to borrow a few things. Gear weight came out to 29lbs. Day 1 weight was 46lbs. With all misc stuff plus food and water. Oh holy hell! What was I thinking. My pack was 46 freeking lbs. American! First day heading into the wilderness. 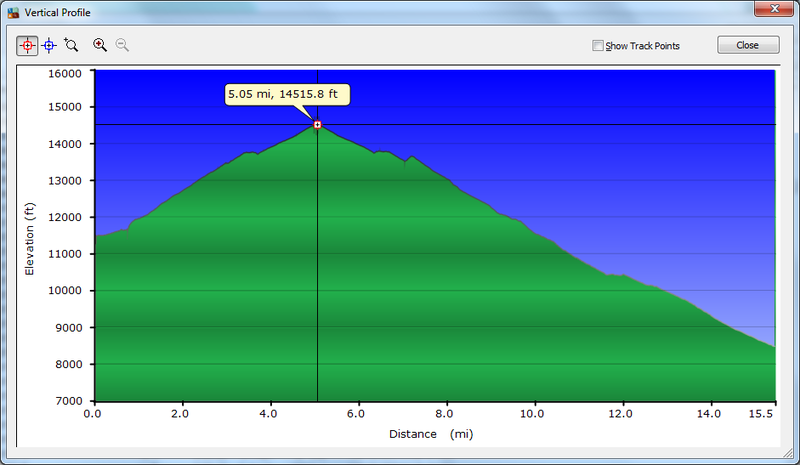 2500 feet of uphill climbing in about 5 miles. This is not a trail but a pass. That means lots of rocks and more rocks and a 1000 or more rock steps. 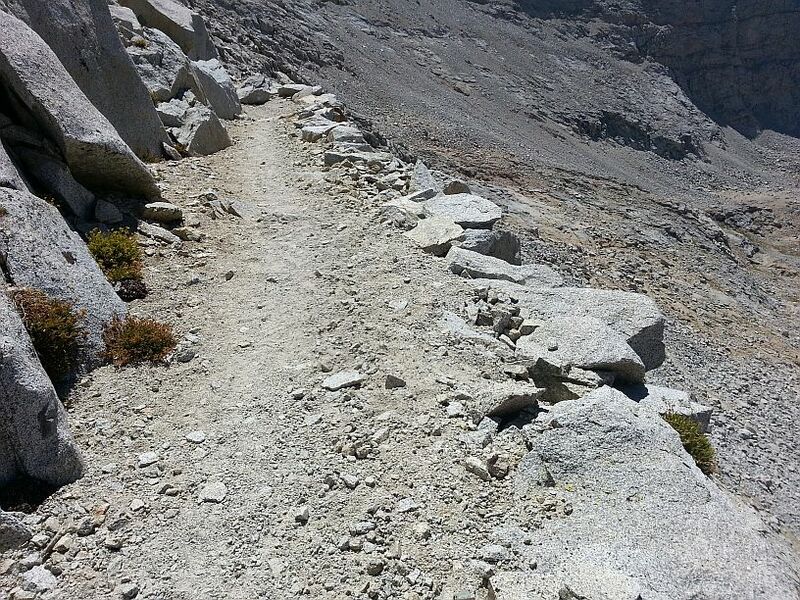 This may or may not be from Kearsarge Pass but this kind of trail is every pass. Phooey! Smoother of the trails but it is still full of rocks and Rock Steps. The switchbacks and uphill are relentless. It took me just under 5 hours to make this exhausting, strenuous climb. Day 1, full pack and I was just about ready to quit. The rest at the top and my delirium compelled me to go down the other side. The whole time I was thinking that the nearby Air Force base and Advanced Weapons Research area could be put to good use to blow this dam pass apart and make it a nice 500' up and over climb. I thought about this a lot. Finally some rest time on the pass. 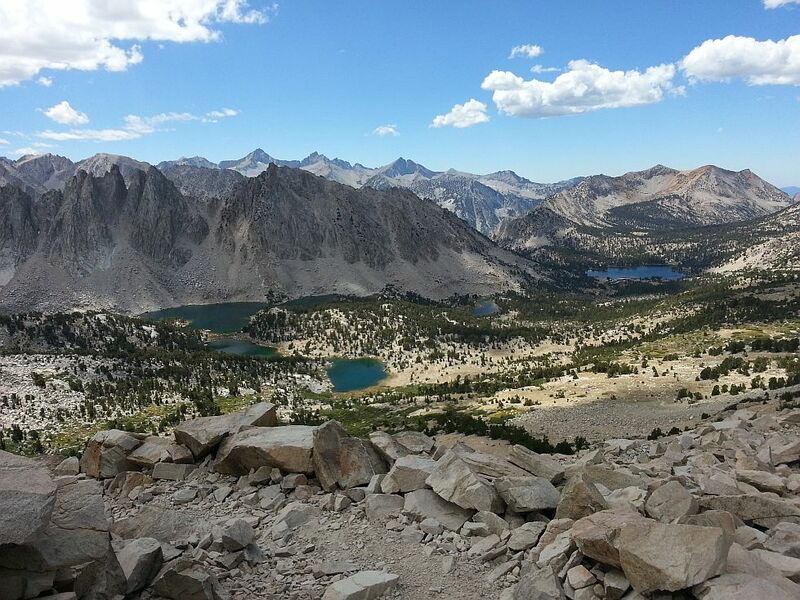 Kearsarge lakes is just a mile or so down the other side and our planned camp site. 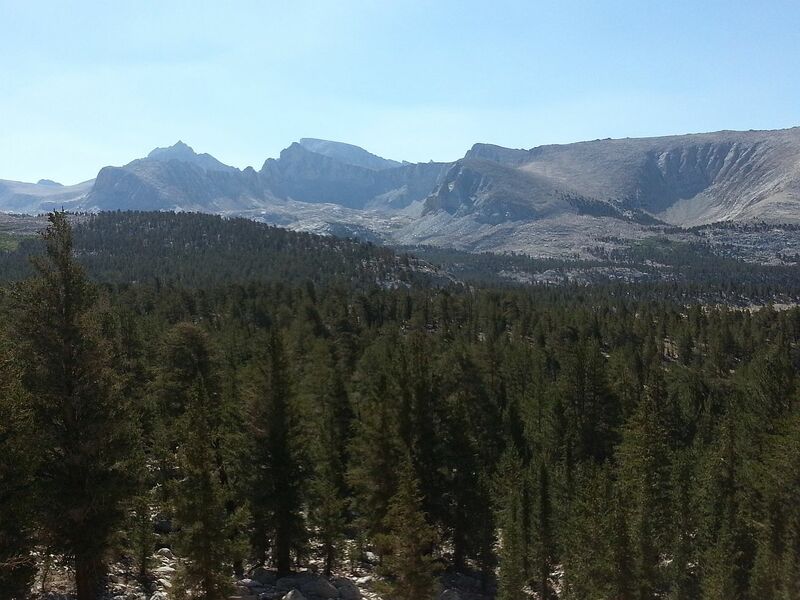 However, plans changed and we decided to push onto Vidette Meadows. 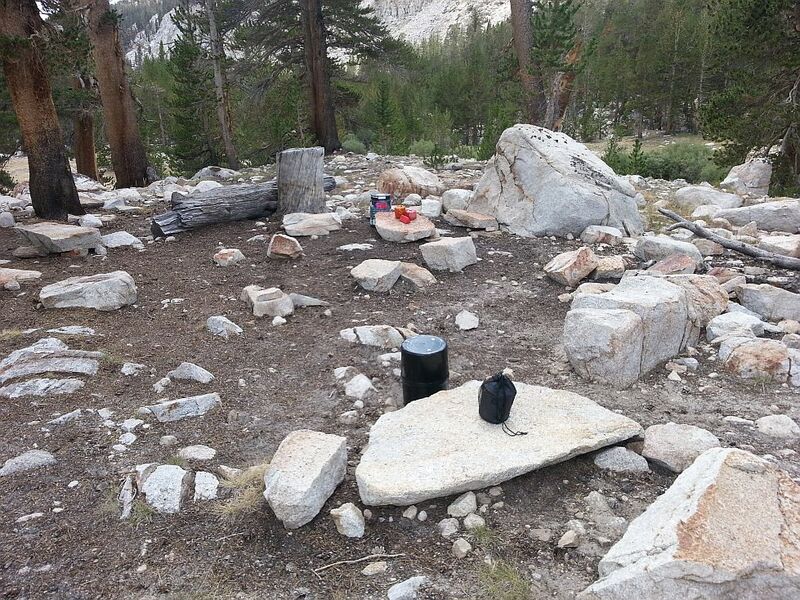 How I wish we would have stayed at Kearsarge Lakes. 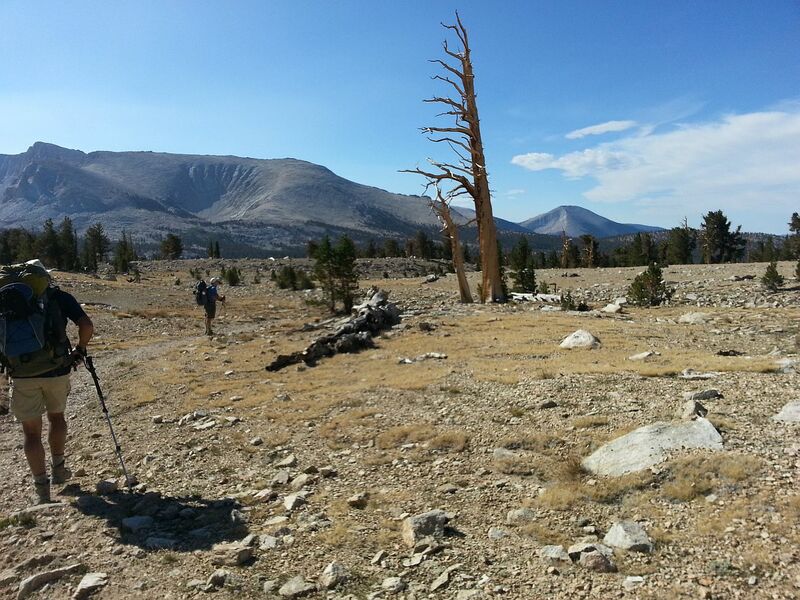 Vidette meadows was about 4 miles away. Downhill. A LOT of down hill. Especially that last 1500' straight down! 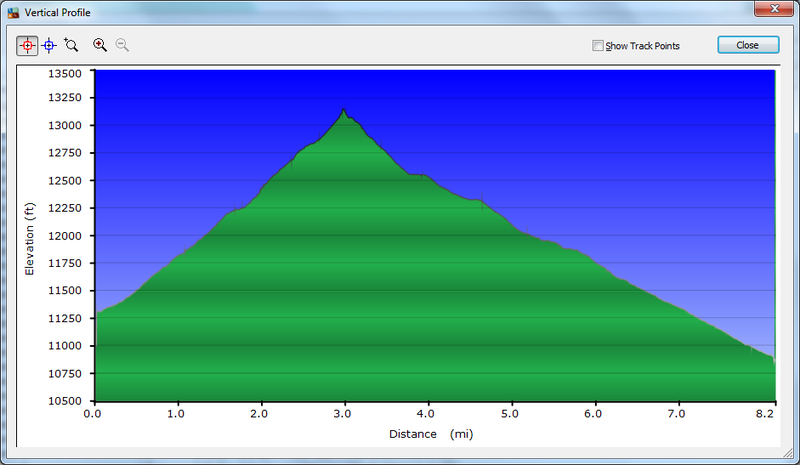 Day 1 hike profile. Ouch! Right around the 6.5 mile marker, I slipped and fell on my backside. I called out to Ant and Laurent to hold up to no avail. I eventually squeaked out a whistle that stopped them. It took a few moments but I was eventually able to get off my back and back on my feet. Luckily, no broken bones or skin and mostly a banged but pair of buttocks. Thankfully this was my only fall. Right around the 7 mile point, I wrenched my knee. This was super painful and was extremely difficult to navigate the 1500' downhill descent. I was extremely slow now. Each step was painful. 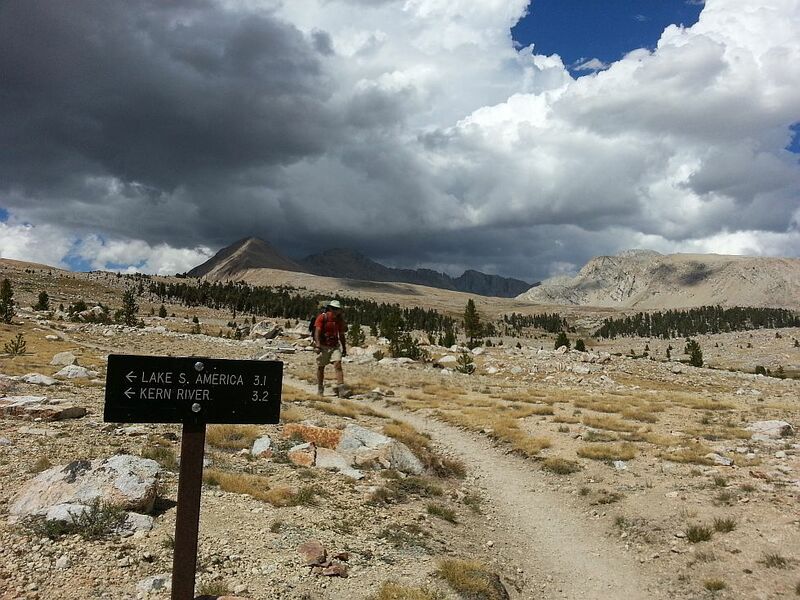 The last mile and a half really had me quitting the next day and working my way back to Onion Valley. Sleep was good except for the pain in my knee. My Cocoon pillow was A.W.E.S.O.M.E. This was a 5.2 mile hike constantly up hill. 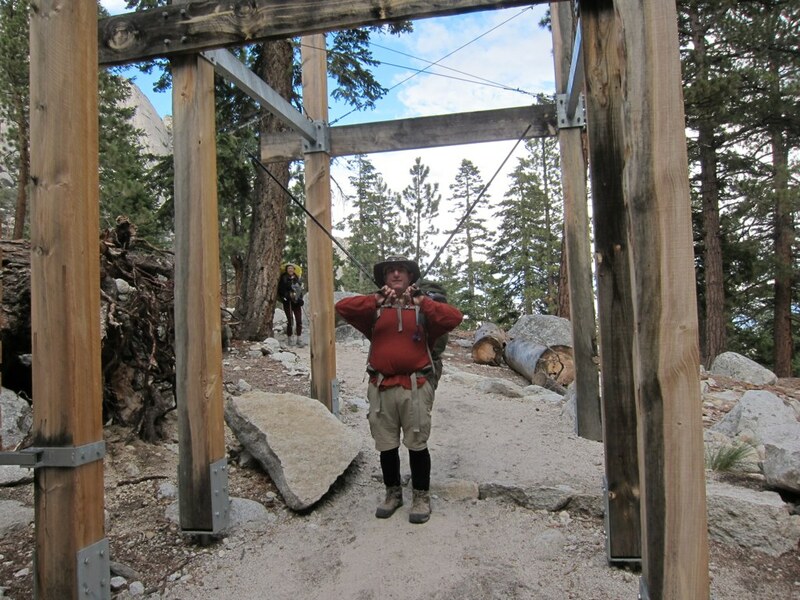 With about 1800' elevation gain, it should have been much easier. But it wasn't. 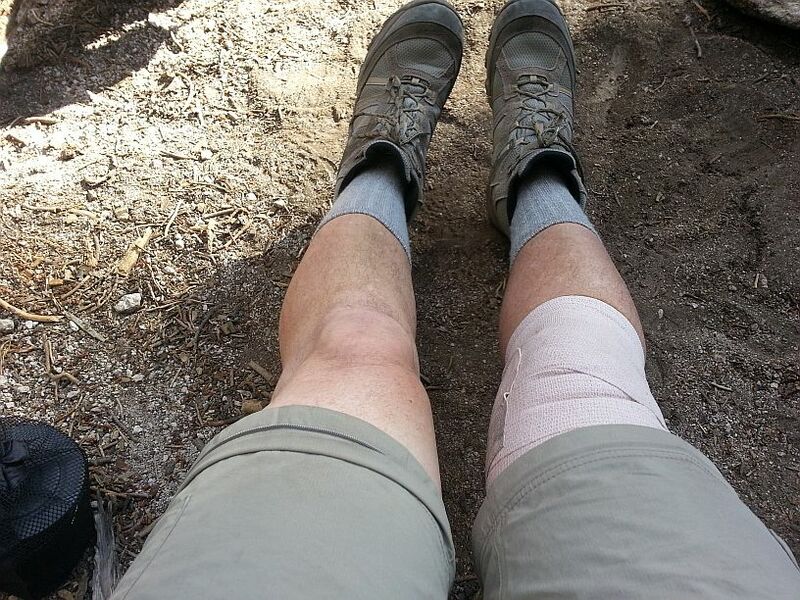 I had my knee wrapped with the ace bandage most the time but the bandage itself was aggravating all the time. Vitamin A (Advil) was helping but the lack of a rock free trail was not helping. At All. Not one bit. After a while, I was able to ignore the pain to a degree. There is nothing I could really do but go slow and favor the knee. This meant that other things started to hurt like my hips because the pack was heavy, never sat right and I was walking funny. 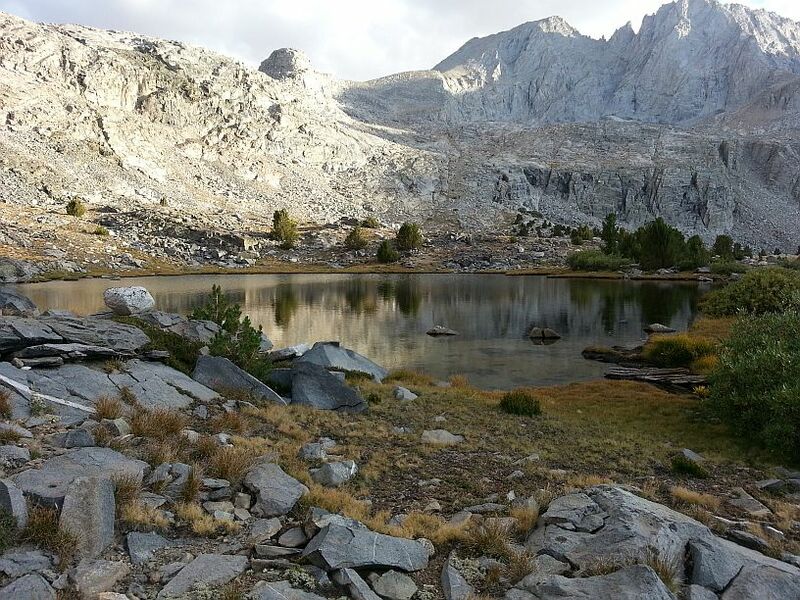 There were just a couple sites at the tarns close to the water. 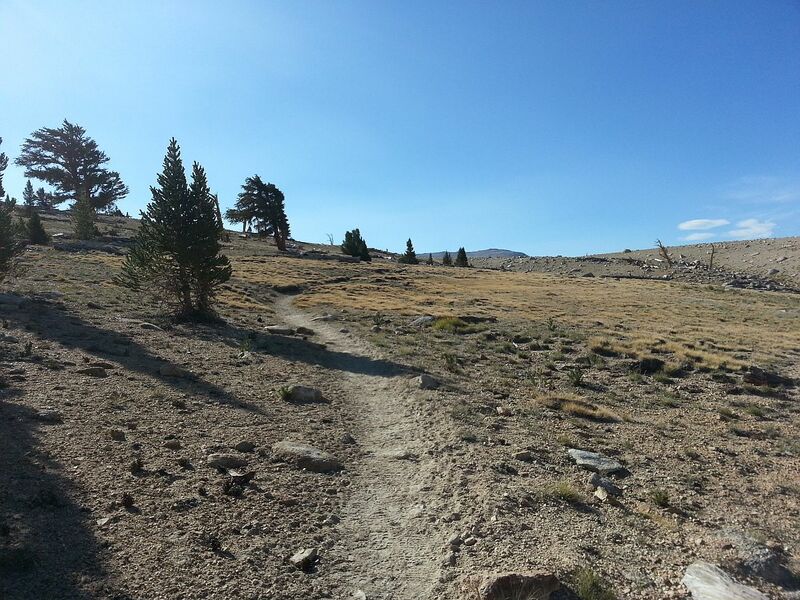 We were a couple hundred yards from the trail and though a number of folks passed by, they were tiny in the distance. They got a lot tinier as they disappeared into the mountain side. This leg of the journey took nearly 5 hours. I took the opportunity to wade into the lake above my knees. The water was really cold but felt great on my knee and feet. Especially my knee. There were a lot of frogs and polliwogs in the lakes and when we filtered water, it look like little brine shrimp or plankton. I was glad to be able to use someone's Platypus water filter rather than the Steripen. This was a great night sleeping though the wind was blowing hard and a lot. It was very clear in the pee hours of the the morning. Shaped up to be a nice, clear day to go over the pass. Wow! What a freeking hard climb. About 2000 feet in three miles straight of the side of a mountain. Mostly. So many more rock steps. Boy was I sick of them. It took close to or over 4 hours. I am not sure anymore. I struggled constantly, stopped often and considered flinging myself over the edge more than once. Sorry, I am not joking. I fantasized about being injured just enough to be transported out. Like a broken leg with bones stick out injury. I guess it was a way to pass the endless hours trudging my way forever and constantly uphill. 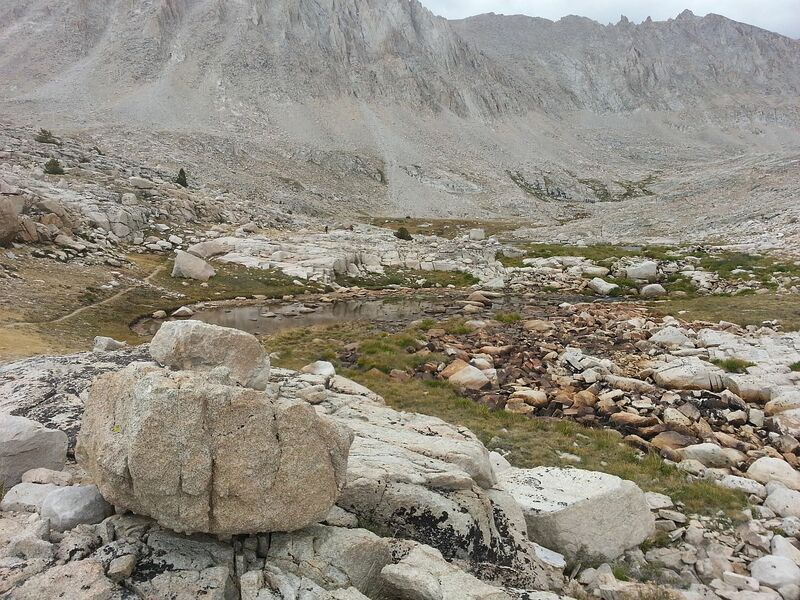 Forrester Pass - It is a lot harder (for me) than this looks. I was passed by 11 people. The last started an hour after I did and passed me. Man that sucked. I did block one last woman from passing me. Sorry, I had my limits and I was just about at the top. 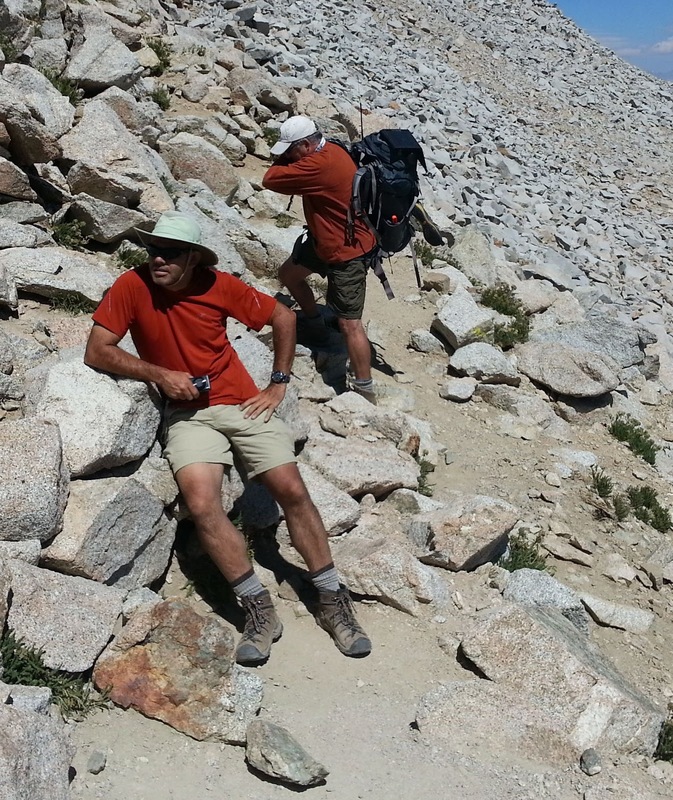 In the picture below, the guy on my right was blocking the trail talking about a trail fatality. He almost met his own demise with a hip check on my way passed. The little girl was wise and got the heck out of the way before I got there. This is all I could muster for a photo op. Hanging over the edge at the pass. It is really far down. We push on to Tyndall Creek to camp for the night. 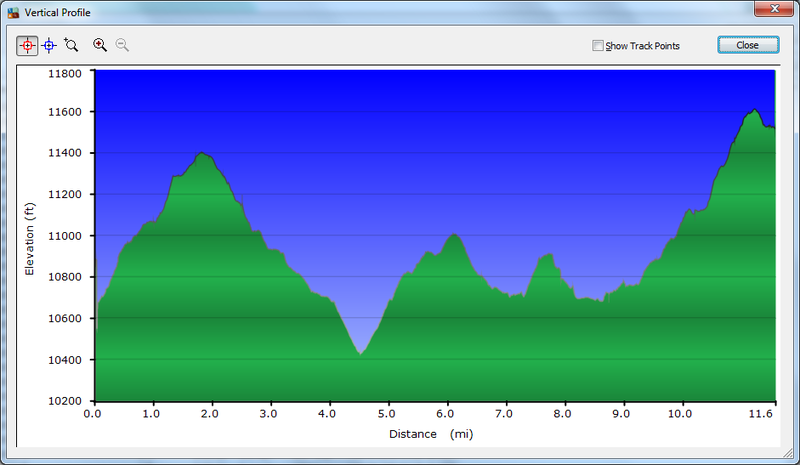 That was a long downhill hike with a great varying terrain and scenery. I was happy to reach Tyndall Creek and have plenty of time to wash my clothes, bathe nekkid in the stream and sun myself dry. Barely got my cloths on when the lady ranger stopped by to flirt with me. I could totally see her dressing me with her eyes. No, this was not the way to Kern River Brewing which sounded really really good about then. Camp at Tyndall Creek. Sadly, no campfires allowed this year. Yay! Rest Day tomorrow. NOT! I was hoping for a short hike / rest day today. 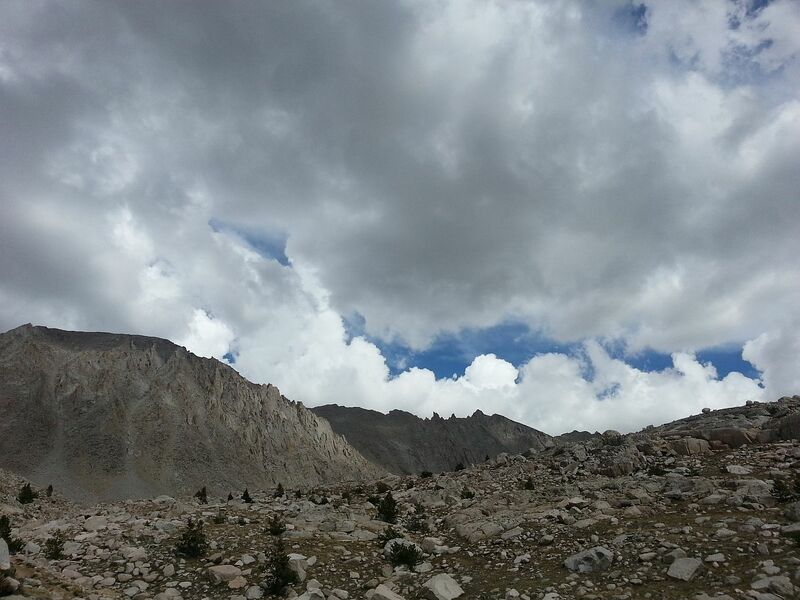 The weather was looking ominous and apprehension and concern was in the air. The plan was to head to Crabtree Meadow for a night or two and rest, fish and relax a bit. 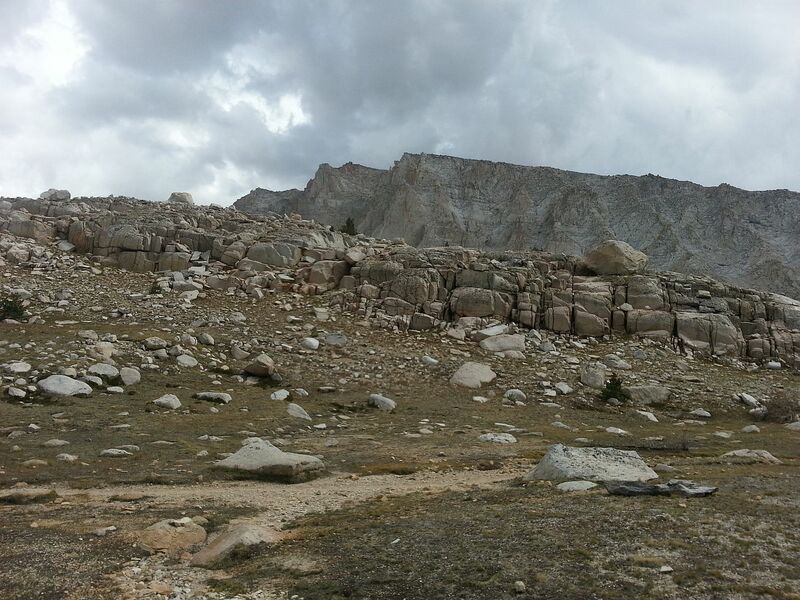 As we move across Bighorn Plateau we could see storms building all around. We could see nastiness in the distance. Little did we know that there was a severe storm warning and these was a crazy weather system. Stuff far away. I think I am going there. Sky not looking so keen anymore. So hoped this was Guitar lake. I was done with hiking for the day. But I wasn't. What another hard day of hiking it was! I was utterly exhausted but had to set up camp quickly, before storm broke loose. Shortly after getting camp setup at Guitar lake, all hell broke loose. Thunder and lightning was all around us. Gigantic booms echoed throughout the canyons. Lightning was all around us. Then the wind and rain came. Rain pounded us for some time. Then it stopped. The temperature just dropped and moments later, the hail started. The hail pelted the tent. It was super loud inside. Then more lightening and thunder. The ground was basically white with hail. Luckily, my site was in a good spot and I did not have any water issues. 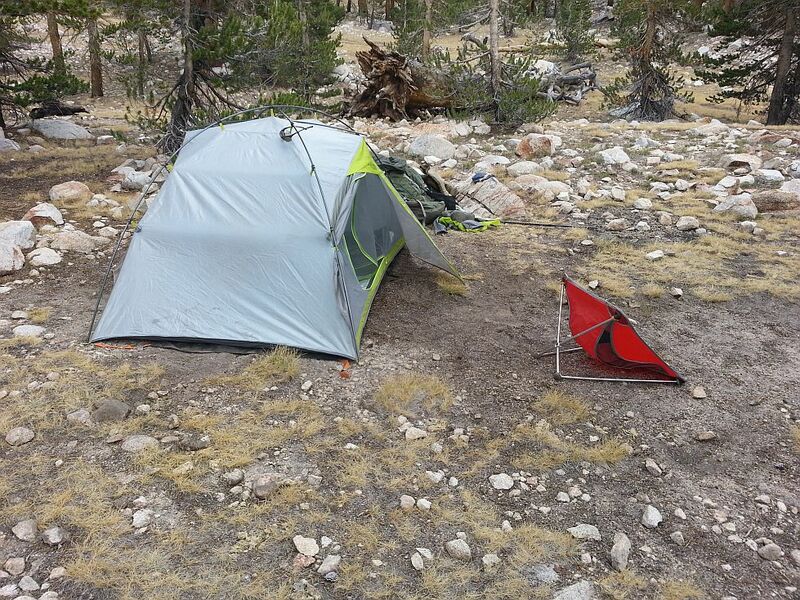 My tent stayed perfectly dry. My companions didn't fare as well. Their site filled with water. Laurent had a hole in his tent floor which allowed water to seep in. 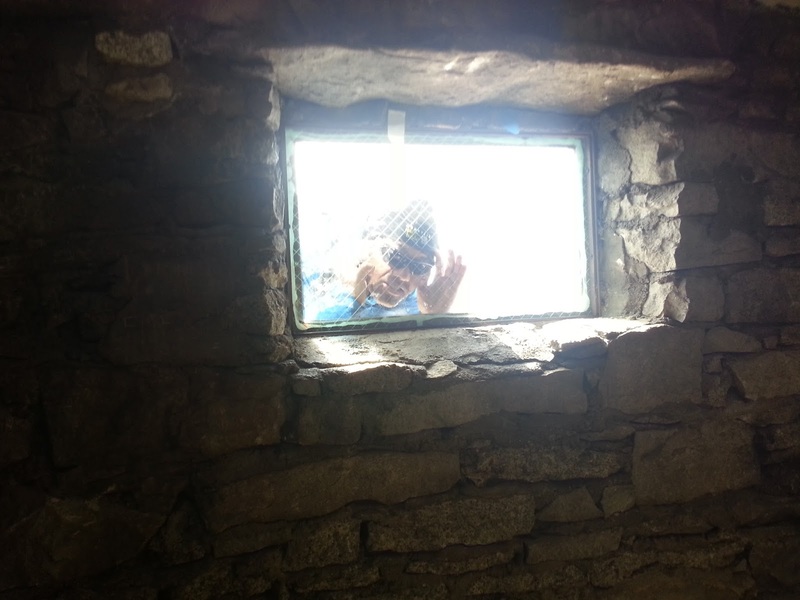 Ant was getting wet too as he was camped in a depression in the rocks which filled with water. I had a nice dinner of cold cheddar quesadilla with Taco Bell hot sauce and In-n-Out ketchup. Sausage sticks for an appetizer and dark chocolate squares for dessert. Typical of each day, I consumed about 1500 calories and burned about 4000 or more. I fell asleep to the massive storm around 7PM. At 11:30 PM I awoke. I think it was still raining. At 12:30 It had stopped. At 3:00 Am it was clear. Storms far to the south were flashing lightning but not heard. 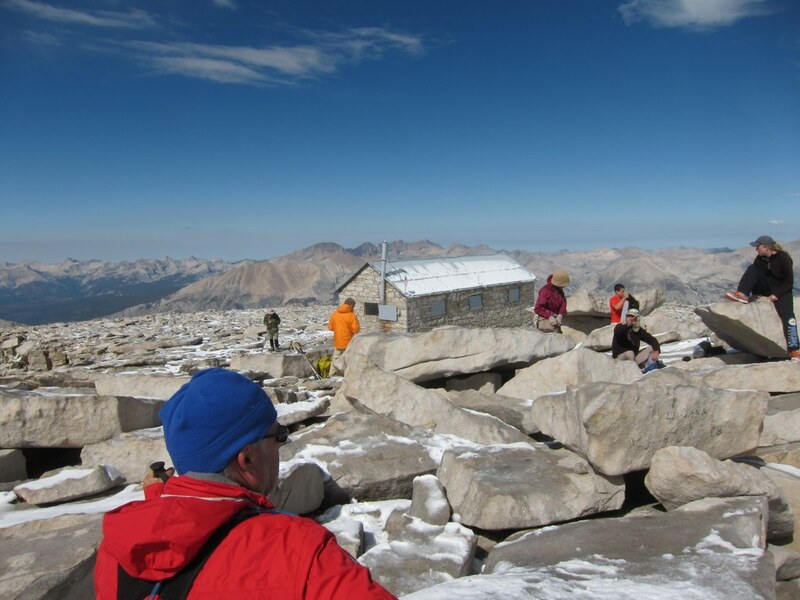 At 4:00AM we decide to summit Mount Whitney. 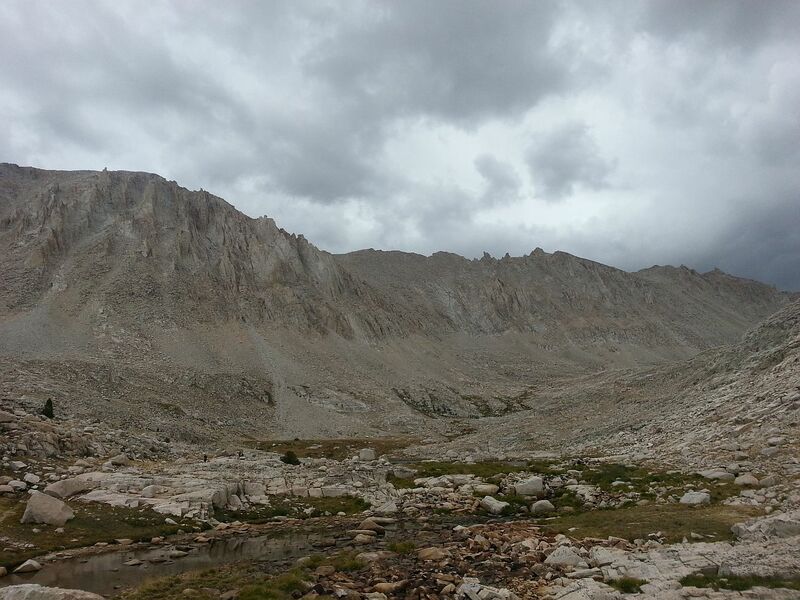 By 5:00 AM when we were ready to head out, clouds were already building over Whitney. At 5AM we head out out of Guitar Lake. There is a bit of light in the sky but clouds are building. The ground is wet and the air is cold. Several stream crossings over the next .7 miles to the base of the Trail Crest path. 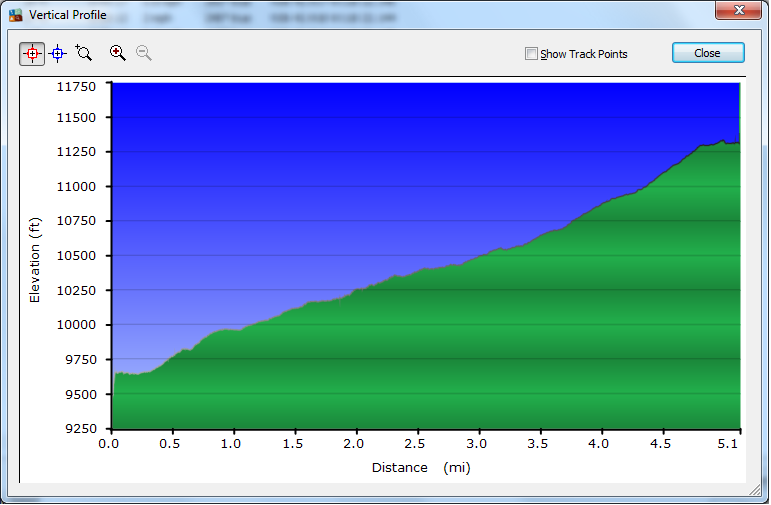 It is super slow going the next 2.5 miles and 2000' of elevation. Switchbacks and rock steps after switchback and rock steps. Just over 3 long exhausting hours later I reached the trail junction. I quickly removed my pack and covered it with my rain cover. 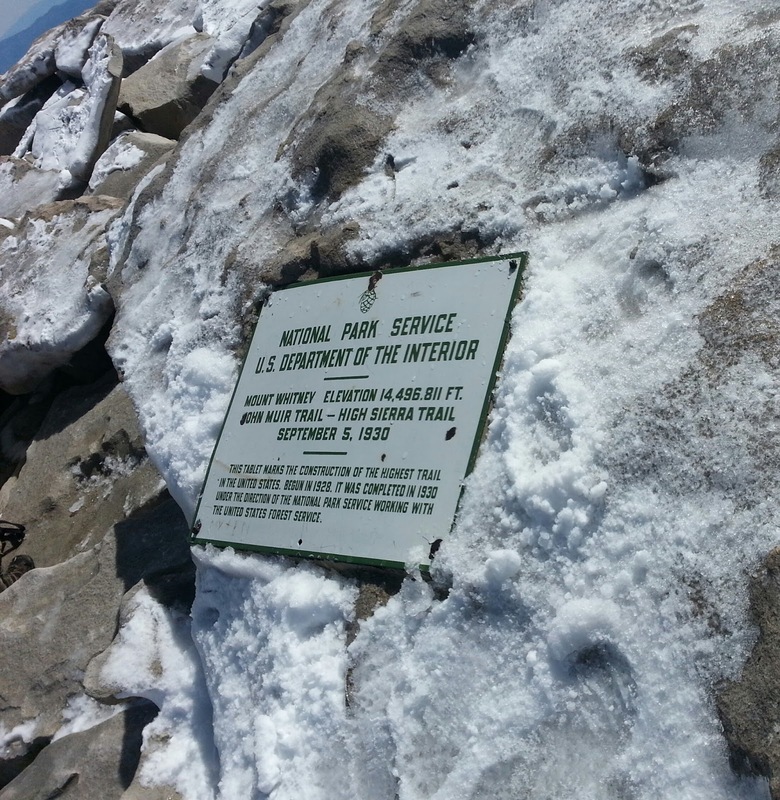 I propped it up on some rocks since there was an inch of snow on the ground. 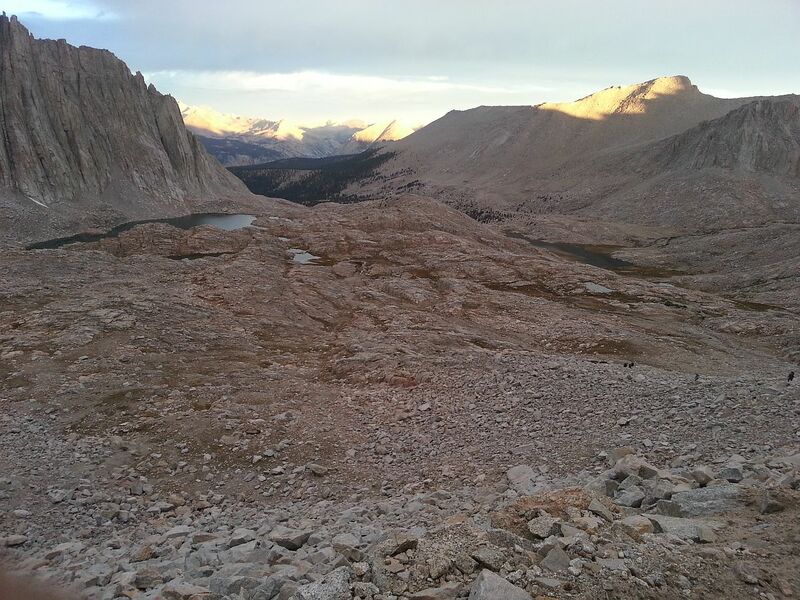 I grabbed my day pack and water and at 8:20AM, I started up the next 2 miles and 1000' climb. 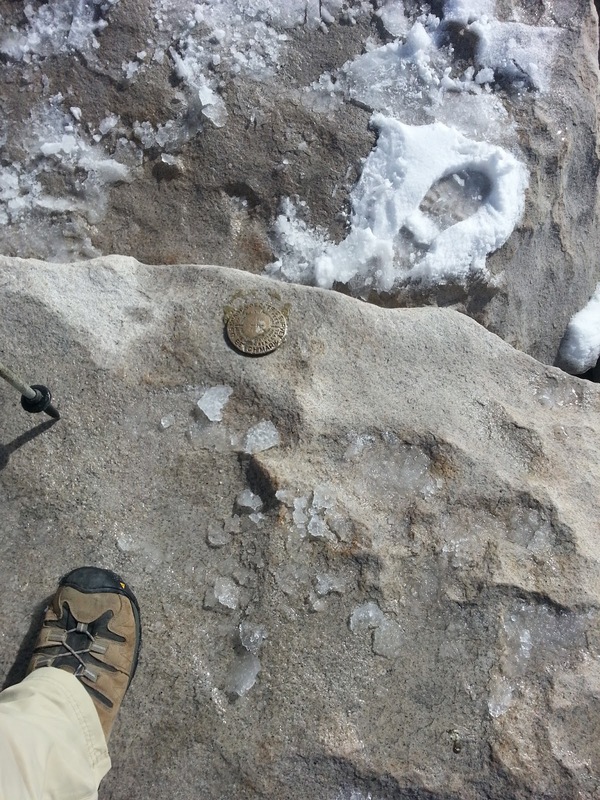 The trail was obscured by snow and ice. Without my pack on, I was moving quickly up the trail. 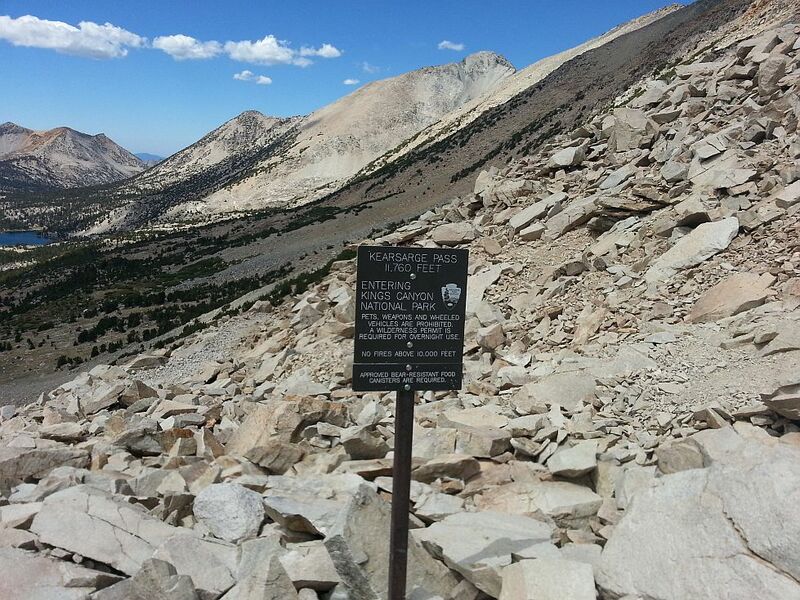 Well, as quick as you can on the treacherous, rugged trail. I passed a few folks on the way up for a change. There were a couple really scary spots that needed extra caution. 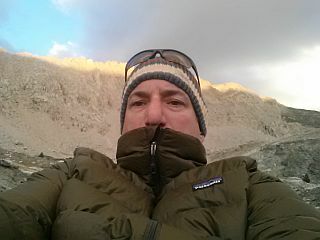 Sadly, it was very cold and was too challenging to remove my gloves and take pictures. I have very few from my ascent. 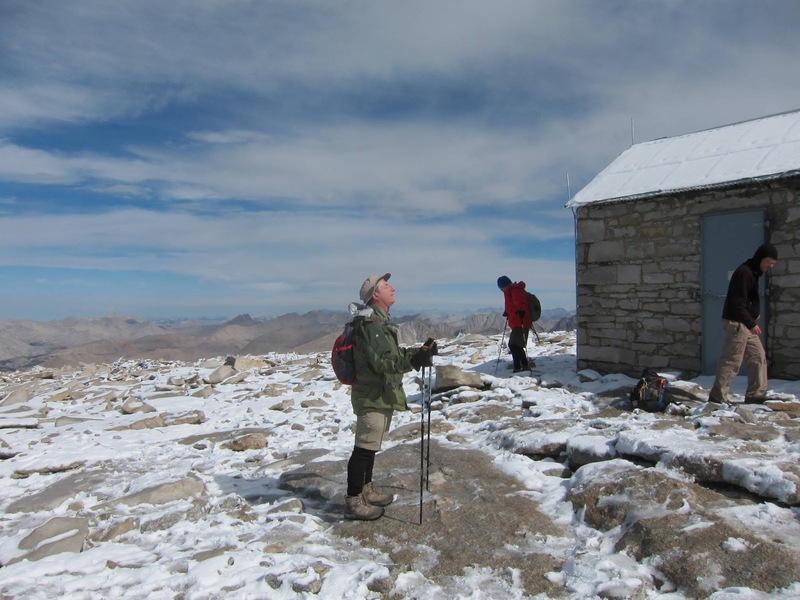 At 9:50 AM I reached the summit of Mount Whitney. After 40 miles, freaky weather, endless up hill and rock steps, I had finally reached the summit! Now, we need to get the heck off the mountain before the severe weather hit. The next 11 miles and 7 hours we rushed down hill. 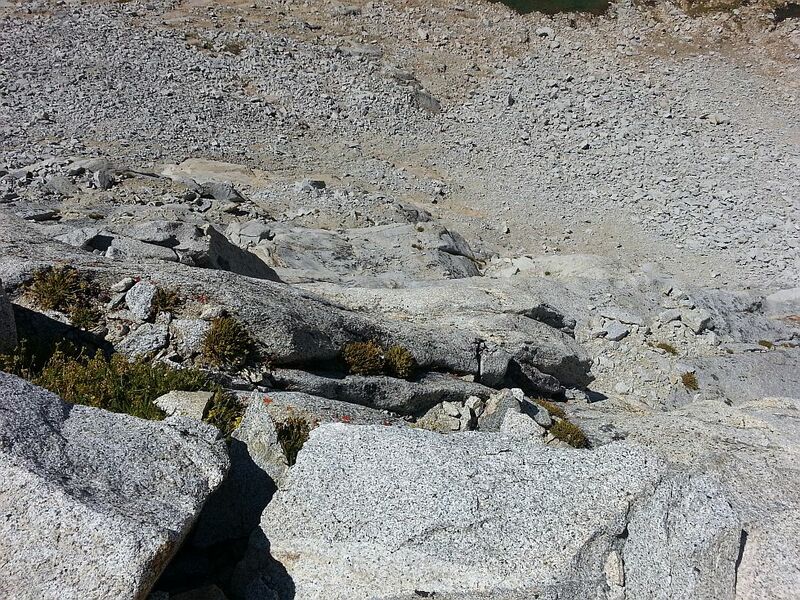 This is a nasty, bone crushing trail with 99 hard switchback with hundreds of rock steps down. The rains meant several parts of the trail were actually a running creek. 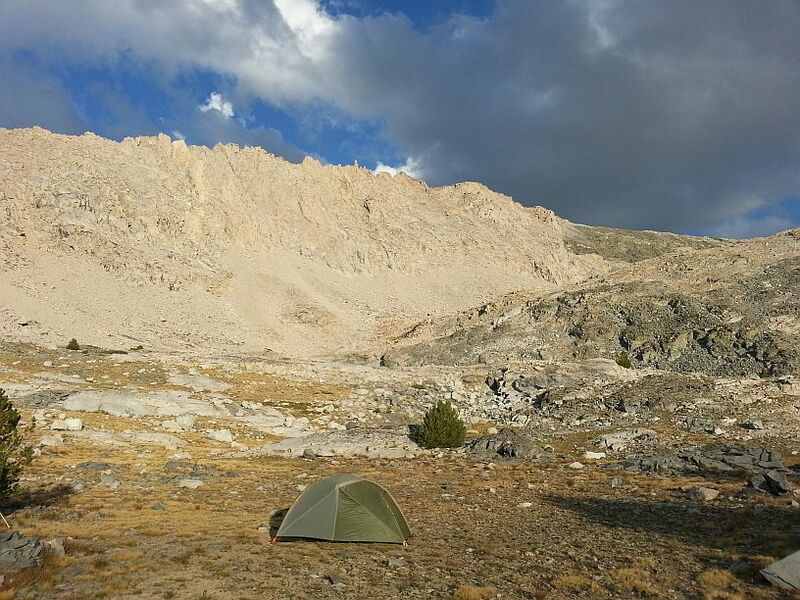 We pushed hard down to Trail camp when the thunder could be heard behind us. We stopped and chatted with the rangers for a couple minutes. I would see one again 20 minutes later who assured me we would be the storms if we kept heading down. I really pushed hard and fast for about 5 miles before every part of my body started hurting. Mostly, every toe and a spot under my foot where a rock found its way. 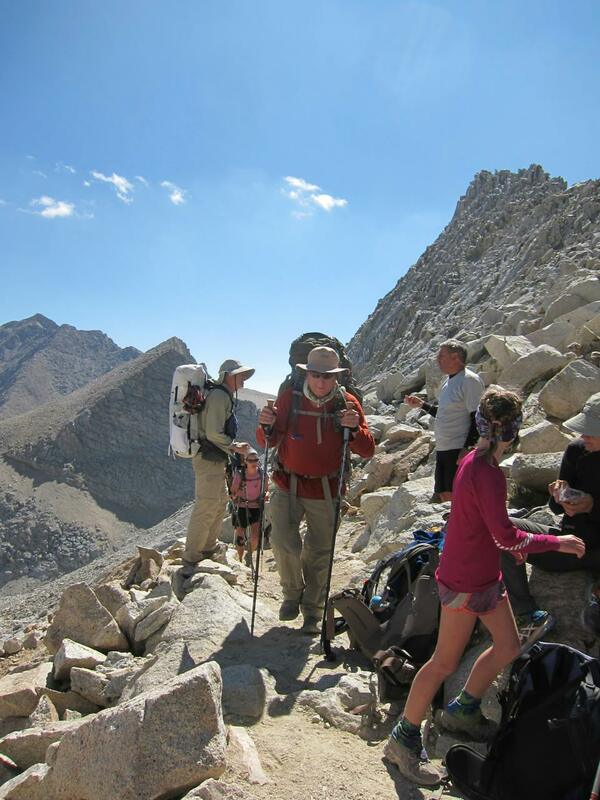 Stopping meant unloading my pack, removing my boots and then putting it all back on. I had no ability to do that. I would never get my pack back on. I stayed with Laurent for a bit but he was soon a fading memory in the distance. Antony caught up after a brief stop and coaxed me along for a while until I was stopped by a couple hikers heading up... Into the tempest, Behind me. After that, Ant was long gone. The last couple miles I was a stumbling zombie. 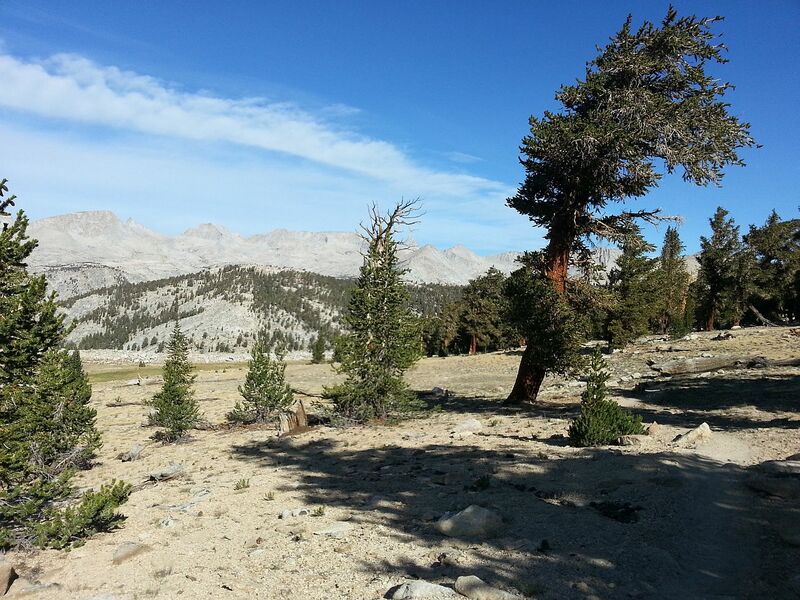 I could see Whitney Portal Road and was hoping the trail head was around every corner. It would be another hour before I finally exited the trail a full 12 hours starting in the early morning. The hike out was over 7 painful hours. My lovely missus met us at the trailhead with fresh fruit and beer but I was barely able to move and in somewhat of a body shock. It took a couple hours but I started feeling better. A Carls Jr Bacon Cheeseburger tasted super-duper! After a long 7 hours drive we arrived home in San Jose at 3AM. I did my best to stay awake and help keep the missus awake. Up a full 24 hours 12 of which were punishing my body and pinching the life essence from my body. I cannot thank Antony and Laurent enough. This was a remarkable journey and for me, almost impossible. 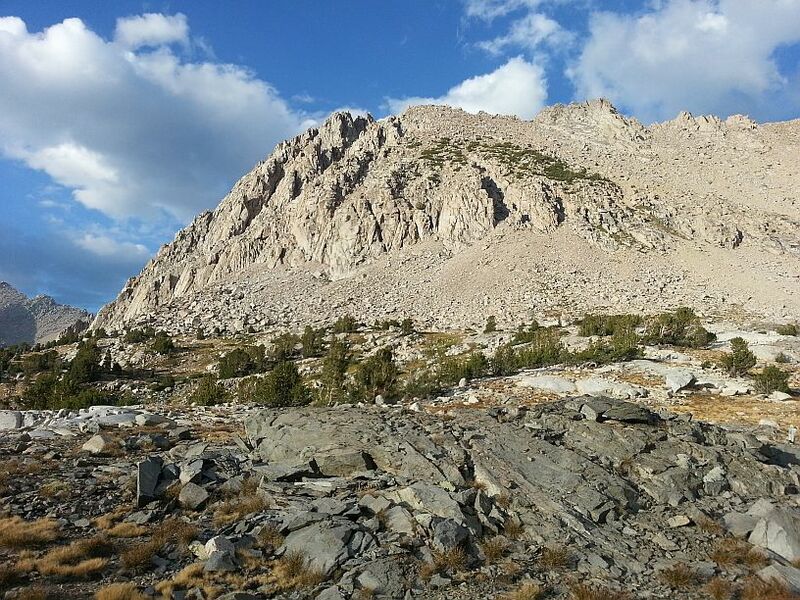 With some relief, the Mount Whitney Sanction failed to eliminate its subject. The sanction expired and finally, the Kill Joe Project is retired.